There’s something about island holidays – they simply scream relaxation. And while our own island may see more grey skies than blue, there’s an archipelago not too far away that boasts sunshine practically year round, magical blue seas lapping sandy shores and more than a hint of Spanish exoticism. 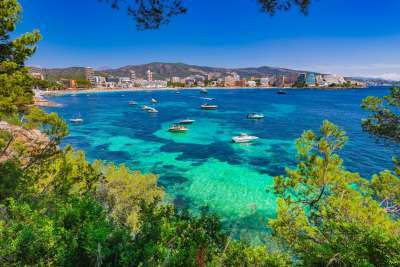 Yes, we’re talking about the Balearic Islands, which offer everything you want from a tropical holiday, and are only a mere two or three hours away. The Balearic's capital, and largest city, Palma de Mallorca is most often used as a transport hub as travellers move from its airport to Mallorca's beach resorts. But this vibrant city is well worth a stay in itself. 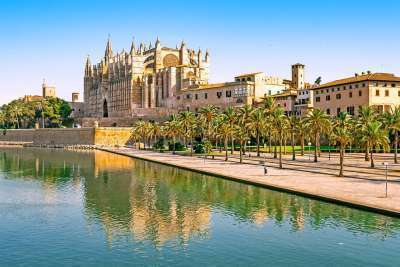 Combining island beauty with manmade marvels, this visual feast of a city is dominated by the hulking, gothic Palma Cathedral, which sits on prime waterfront real estate. Though it's as incredible as any other house of worship you'll find in continental Europe, it's not the city's only draw. There's the maze-like streets that belie the island's Moorish past, markets selling the best produce Mallorca has to offer, and public squares lined with restaurants serving locals and visitors alike. 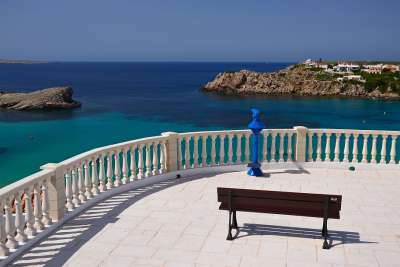 On the south-east corner of Menorca sits sunny little Punta Prima. One of the island's older resorts, it hasn't changed a great deal since it first gained popularity - but this is no bad thing. It's lost none of its laidback pace, and the lack of high-rises means you won't have to vie for space on its stunning white-sand, Blue-Flag beach. Said beach's gentle shelving into the sea makes it great for the kids, and the smattering of restaurants and bars dotted through town means you won't be overwhelmed by choices of where to eat and drink. If one thing in life is certain, it's that you'll never get bored in Playa d'en Bossa. This resort is the beating heart of Ibiza's - not to mention Europe's - clubbing scene. Boasting some of the biggest names on the nightlife circuit, including Bora Bora and Ushuaïa, you'd think that the town would be all about dancefloors and downlights. Yet it also has the privilege of boasting the longest beach on the island, and all the watersports and daytime delights you can dream of. 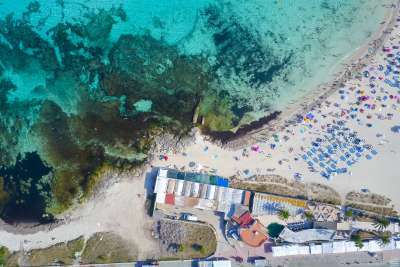 If a paradise holiday is what you're after, but you're not willing to commit to a long-haul flight or thousands of pounds, Formentera might be right up your alley. 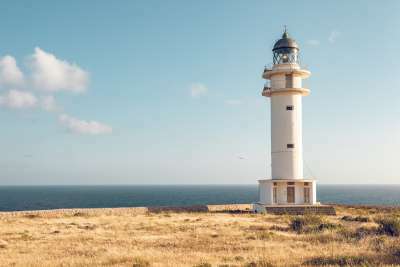 The smallest inhabited Balearic island, it's just a 17km ferry ride from its more manic neighbour Ibiza - but feels like it could be a million miles further. With 69 miles of coastline framed by bright blue water - and a ban on buildings right on the beach - it's a safe haven of Blue-Flag beaches, laidback bars and, well, not much else. Hey, if it's good enough for Bob Dylan and Leonardo DiCaprio, it's good enough for us. Here's one for the history buffs. 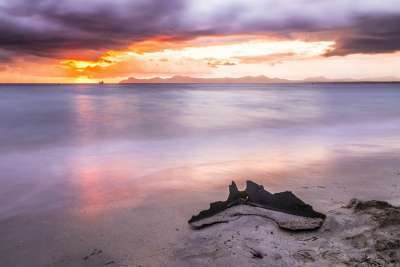 Alcudia is a storied town, which has been inhabited since the Bronze Age and reflects Mallorca's long and varied history. From the remains of the Roman town that was established here in the 2nd century BC to the medieval walls built to protect the town from pirates, and the small, winding streets from its time under Arabl rule, it's rich with cultural and history. 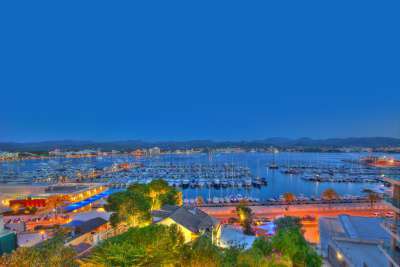 Plus, it's only two miles away from the resort of Port d'Alcudia, which boasts white beaches and family friendly hotels. 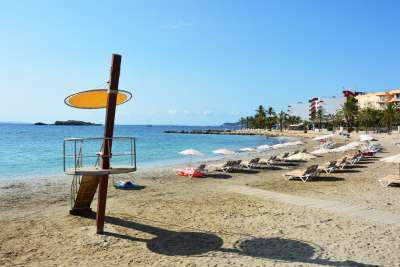 Smack-bang in between the clubbers' delight of Playa d'en Bossa, and the equally wild Ibiza Town, Figueretas is well-placed for those who want to stretch out on a relaxing slice of beach during the day and put on their dancing shoes in the evenings. It's just a 15-minute walk from the nightclubs of both Playa d'en Bossa and Ibiza Town, yet still remains family friendly and laidback. Framed by palm trees, its beach has more than enough different watersports on offer to last your entire holiday, and a sprinkling of bars if an easy cocktail is on the agenda. Clinging to the cliffs of Menorca's craggy north coast, the whitewashed buildings of Arenal d'en Castell are just a short drive from Menorca's capital of Mahon. Surrounded by lush forest, a visit here will make you feel like you're on an entirely different planet to the rest of Menorca! Its horseshoe-shaped, golden-sand beach is shielded from view by slopes on one side, and a bay almost entirely enclosed by cliffs on the other. 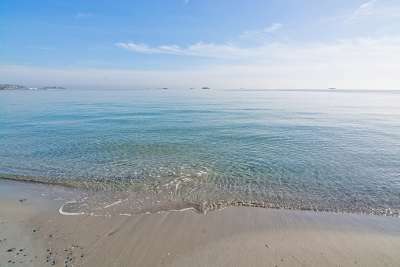 The beach's shallow waters make for a safe paddling pool for the kids, while a slew of walks and cycling tracks are right on your doorstep. Magaluf - or Shagaluf, as it's affectionally been dubbed over the years thanks to its naughty after-hours activities - has been a firm favourite of us Brits for several decades now. We don't know if it's the huge number of package tours on offer, its mega nightlife scene, or its sandy beach - but what we do know is that our enthusiasm is showing no signs of abating! If you're not keen on joining in on the night-time fun, there's still plenty to keep you entertained, including waterparks, go-karting and upscale beach clubs. But don't fear, the regularity of hen and stag dos show no signs of tapering off any time soon! 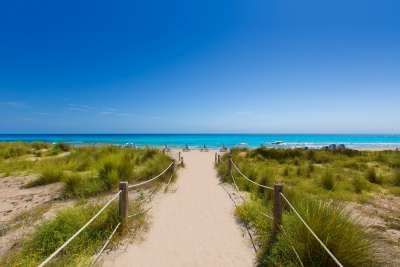 From the wild evenings in Magaluf on to the family friendly delights of Son Bou in Menorca, which boasts the island's longest beach. One of Menorca's newest resorts, it's loaded with all the amenities you need for a getaway with kids of all ages - shops, restaurants with kids' menus, a disco, waterpark, bowling alley and giant maze! If you're looking for something a little more cultural, you won't be disappointed either. The town is home to the remains of a 5th-century Christian basilica, and a short drive away you'll find the utterly charming town of Ciutadella with its winding cobbled streets and ancient palaces. If you thought Ibiza's nightlife was confined to Ibiza Town and Playa d'en Bossa, you'd be sorely mistaken - the resort of San Antonio, on the other side of the island, more than holds its own. There are several super-clubs - and a 'disco bus' runs from San Antonio to the island's other clubbing hubs all night long. What really sets San Antonio apart, though, are its famous sunsets - from San Antonio's pretty beach you'll be in perfect location to catch its blaze of reds and pinks as its slides below the horizon.